Sylvanus H. Vaughan (1827-97) operated a livery, sale and boarding stable at Middleborough Center during the last quarter of the 19th century. Vaughan appears to have learned the livery trade from James Cole, Jr., a noted livery operator in Middleborough during the mid-1800s. Vaughan is recorded as a horse dealer in 1860 residing with the Cole family, and he was no doubt employed by Cole at that time. 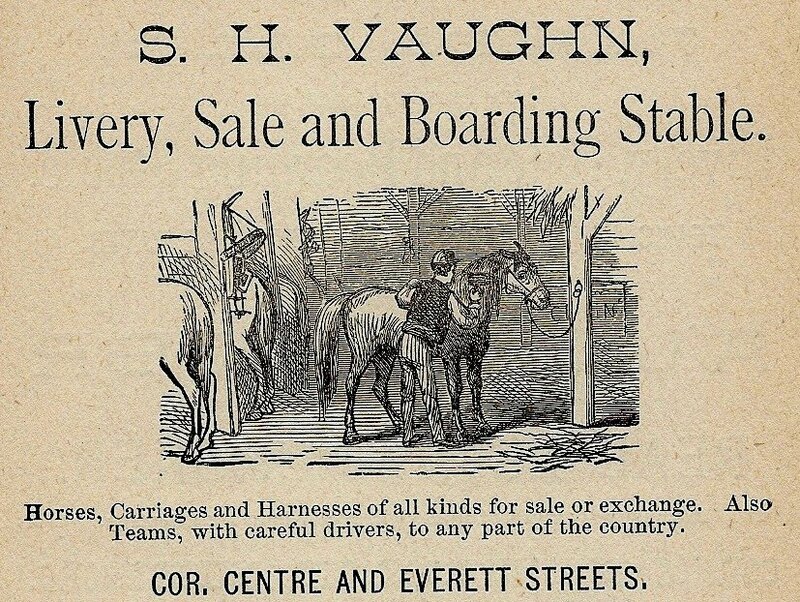 Vaughan a short time later became the owner of the Nemasket House hotel on North Main Street, purchasing it in 1864, and it is there that he probably began his own livery business, the rental and boarding of horses being an important part of the hotel operation. Purchasing a large vacant lot of land on the northwest corner of Center and Forest Streets from George F. Hartwell in July, 1868, Vaughan immediately constructed a large stable building set back from the street, opening business that autumn. Vaughan’s was one of the more substantial livery operations in town at the time. Later, he constructed the house on the corner of Center and Forest Streets as a residence for himself. In August 1882, Vaughan sold his homestead property to Nahum D. Wilbur, continuing to operate the livery stable in its original location until the mid-1880s when he relocated nearby to the east side of Everett Street just north of Center Street. The Vaughan livery stable appears to have remained in operation until Vaughan’s death in 1897. 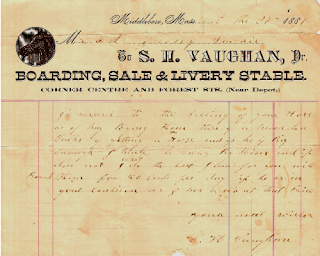 At the time Vaughan penned this note, his business was located near the corner of Center and Forest Streets. 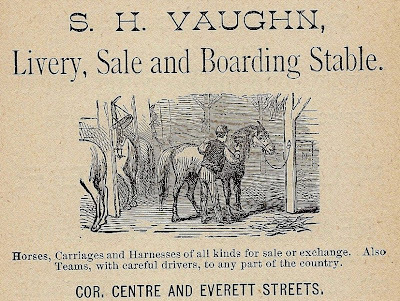 S. H. Vaughn [sic] Livery, Sale & Boarding Stable advertisement, History and Directory of Middleboro, Mass., for 1889 (Needham, MA: A. E. Foss & Co., 1889), p. 85. An unfortunate compositor spelled Vaughan's surname incorrectly, leaving out the second "a". The mistake was corrected in subsequent ads. Local residents, nonetheless, well knew Vaughan's establishment which was relocated to Everett Street in the mid-1880s. Proximity to the local railroad station on nearby Station Street no doubt helped promote Vaughan's business.